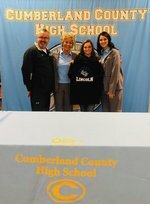 On behalf of the CCHS Lady Jet Basketball Team & Coaches , we are PROUD to announce that Senior, Gracee Dishman will be continuing her academic journey and basketball career at Lincoln Memorial University in Harrogate, TN. Gracee has worked hard to achieve this goal and it has always been her dream to play college basketball. As both a Lady Rebel at South Cumberland & a Lady Jet,Gracee has always been a "gym rat" working to be her BEST, always loving to compete, and pushing to WIN. She has an awesome work ethic and fierce drive that will continue to be a leader both on and off the basketball court. As a CCHS Lady Jet, Gracee and her senior teammates, have continued a legacy of success with 78 varsity wins and numerous championship titles including "3 PEAT" District Championship Titles (2016, 2017, & 2018), 2017 Innisfree Beach Whattaburger Champions, Windermere Prep Rock Holiday Classic Champions, Tampa Bay Sefner Christian Academy Christmas Champions, 2 Sub-State Sectionals, and they are "Always Chasing... Together" the goals for the 2018-2019 season. Gracee was also a 2018 Miss Basketball Finalist for Class AA, District 7 AA Player of the Year, District 7 AA Tournament MVP, 1000 pt club member, All-Time Leading Scorer in Lady Jet Basketball with 2099 points, 2nd All-Time Leading Scorer in CCHS Basketball. Gracee is looking forward to her senior season as a CCHS Lady Jet and to continuing her academic journey and basketball career at Lincoln Memorial University. WE are very proud and excited for Gracee and for the Lady Jet Basketball program. Gracee understands "WIT"(Whatever IT Takes). Her work ethic, dedication, love for the game, competitive drive, academic excellence, skill-set, and abilities, will continue to be her foundation for success both on and off the basketball court.